Analysts have shrugged this off as a simple anomaly due exclusively to cold weather. However, there has been continued weakness in many sectors of the economy (including housing) into the warm spring months. Meanwhile, the stock market has not only ignored the weakening data, but continues to surge higher every week. It is now pricing in perfection moving forward the next 12 months and beyond. The green bars show the return of equity inflows from 401k funds which tends to occur at a cyclical peak when the public rushes in to capture the easy stock market fortunes that await. 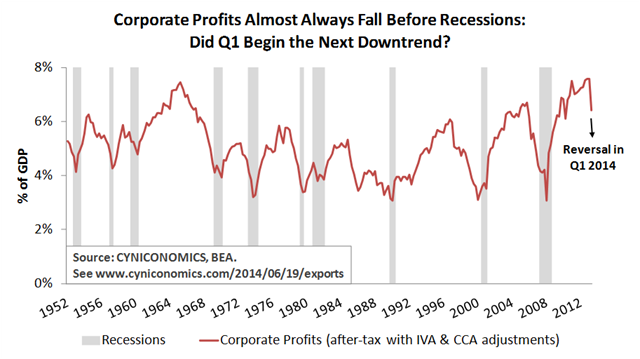 Perhaps the economy resumes its cyclical growth, housing begins to turn up again and corporate profits once again accelerate higher. The problem is the market has already priced in this utopia. It is only confidence and euphoric speculation now pushing it higher.